Piasecki Helicopter designed and successfully sold to the United States Navy a series of tandem rotor helicopters, starting with the HRP-1 of 1944. The HRP-1 was nicknamed the "flying banana" because of the upward angle of the aft fuselage that ensured the large rotors did not strike each other in flight. The name would later be applied to other Piasecki helicopters of similar design, including the H-21. In 1949, Piasecki proposed the YH-21 Workhorse to the United States Air Force (USAF), which was an improved, all-metal derivative of the HRP-1. Using two tandem, fully articulated three-bladed counter-rotating rotors, the H-21 was powered by one nine-cylinder Curtis-Wright R-1820-103 Cyclone supercharged 1,150 hp (858 kW) air-cooled radial engine. After its maiden flight in April 1952, the USAF ordered 32 H-21A SAR models and 163 of the more powerful H-21B assault transport variant. The H-21B was equipped with an uprated version of the Wright 103 engine, developing 1425 shaft horsepower (1063 kW), and featured rotor blades extended by 6 inches (152 mm). With its improved capabilities, the H-21Bcould carry 22 fully equipped infantrymen, or 12 stretchers, plus space for two medical attendants, in the medevac role. With its Arctic winter capabilities, the H-21A and H-21B were put into service by both the USAF and the Royal Canadian Air Force (RCAF) to maintain and service DEW(Distant Early Warning) radar installations stretching from the Aleutian Islands and Alaska across the Canadian Arctic to Greenland and Iceland. In 1952, some H-21As were evaluated by USMC helicopter squadron HMX-1 in the air assault role. In 1957, an H-21B was loaned to the United States Marine Corps (USMC) to evaluate the helicopter as an airborne tug to tow disabled landing ships and amphibious landing vehicles to the beach. During the evaluation, the H-21B towed an LST at 5 knots and a simulated tracked amphibious vehicle from the water to the beach. The uprated 1425 hp Wright engine used in the H-21B was also used in subsequent variants sold to both the U.S. Army (as the H-21C Shawnee) and the military forces of several other nations. In 1962, the H-21 was redesignated the CH-21 in U.S. Army service. In 1959 Vertol Aircraft, the new name for Piasecki Helicopters, came up with a concept for heavy lift over short distances where between two and six H-21Bs would be linked by beams to lift heavy loads. It was considered to be unsafe, because if one helicopter had mechanical problems during the lift it could cause an unbalanced situation and cause all helicopters to crash. 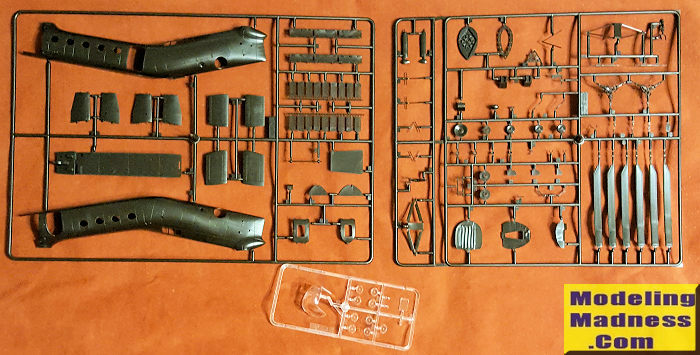 As is often the case with Italeri kits, this one did not have an inner bag containing the parts. Therefore I can show the actual sprues, which should please some readers. The kit is new enough to have engraved detailing that this one was free of flash and while there are ejector pin marks on pieces, from the look of it, most will be hidden if one keeps the doors closed. The cockpit is well appointed with collective, cyclic and pedals being separate. The cabin area has jump seats to help fill the space. All of the windows save the cockpit's are installed from the inside so one should either prepaint the exterior or prepare for some masking. Also noticed is that the prominent engine cooling screens on the top of the fuselage are not supplied. Italeri provides a template so you can make your own out of whatever material is at hand. I'd think plastic window screen might be useful for this if the mesh is fine enough. There are also some holes to open depending on which markings version you will be building. When attaching the fins, note that the German version has larger versions than the French and US options. These are provided. The German variant has an external rescue hook. This variant also has faired landing gear so be sure not to get those confused, even though the part numbers shown for the nose gear are the same. Underfuselage antenna suites are also different. There are separate sections in the instructions for the German plane so this is a big help. The rotor heads look convincing enough and the blades are slightly curved to give some droop to them. Instructions are well done with Model Master color references. The US Army option is OD, Medium Green, and Dark Tan splotches. The French plane is overall Blue Angel Blue while the German plane is just OD. 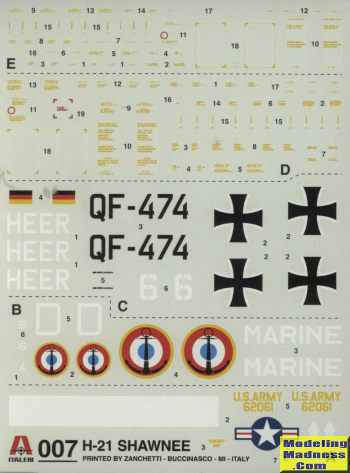 Decals are nicely printed and offer the usual mass of stencils. If you decide on aftermarket decals, do your research to be sure that you have the right fins, landing gear, and antenna arrangement as these helicopters were offered in a variety of configurations. 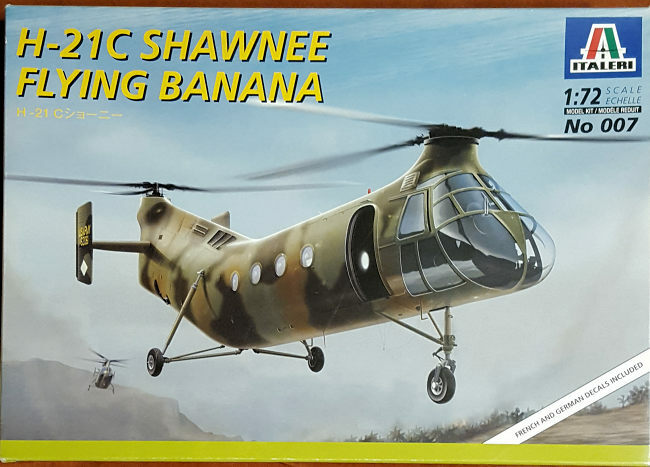 This looks like a very nice kit of this fairly important helicopter. Of course, building will be the telling, but my experience with Italeri kits has generally been quite positive and I'm betting this one will be the same.